Now! Find Your Perfect Room in Denver! Five Points Jazz Festival (May 19) – This free festival takes place the third Saturday of May and celebrates the history of Denver’s Five Points neighborhood. Once known as the Harlem of the West, Five Points was home to several jazz clubs which played host to many of jazz music’s legends such as Miles Davis, Thelonious Monk and many more. The festival features a diverse lineup of music – from Latin to blues to funk and many other styles of jazz. Denver Day of Rock (May 26) – Denver Day of Rock is a free event that features five stages of live music along Denver’s 16th Street Mall on the Saturday of Memorial Day Weekend. Denver Day of Rock unites the community through music and family-friendly entertainment while also raising funds to support Amp the Cause, a Denver nonprofit that raises awareness about critical family issues and local charities. Headliners for 2018 include Elle King, Delta Rae, Dwayne Dopsie and The Zydeco Hellraisers, A Thousand Horses and Roger Clyne & The Peacemakers, among many other bands. Grandoozy (September 14-16) – This September, Denver will host the first ever Grandoozy – the latest large-scale festival from Superfly, the producers of the wildly popular Outside Lands and Bonnaroo. Headliners include Kendrick Lamar, Florence + The Machine and Stevie Wonder, and the festival will also host The Chainsmokers, Logic, Sturgill Simpson, Miguel, Phoenix, Young the Giant, St. Vincent, The War on Drugs, Ty Dolla $ign, Kelela, Denver locals Tennis, and many more on multiple stages over weekend. Grandoozy will also showcase Denver’s local culture, culinary scene and love of the outdoors with multiple experiences throughout the festival grounds. Levitt Pavilion – Located in the historic Ruby Hill Park, Levitt Pavilion opened in June 2017 to near immediate acclaim – the venue was named one of Billboard’s “20 Freshest Venues to Watch in 2018.” Focused on building community through music, Levitt Pavillion offers both free and ticketed concerts. The free concerts aim to cultivate local and independent acts; and this year’s shows include Tommy Emmauel, Della Mae, The Hillbenders, HONEYHONEY, Ripe and more. Ticketed events this summer include headliners Home Free, Robert Earl Keen and War & Tower of Power with guest and local Denver artist, Megan Burtt. Denver Botanic Gardens Summer Concert Series – The Summer Concert Series at Denver Botanic Gardens’ York Street location brings sought-after artists to concert goers within an incredibly unique setting of thousands of blooming plants. This year’s series will feature top acts like the Violent Femmes, Melissa Etheridge, Amos Lee and more. Tickets are available through the Denver Botanic Gardens website. 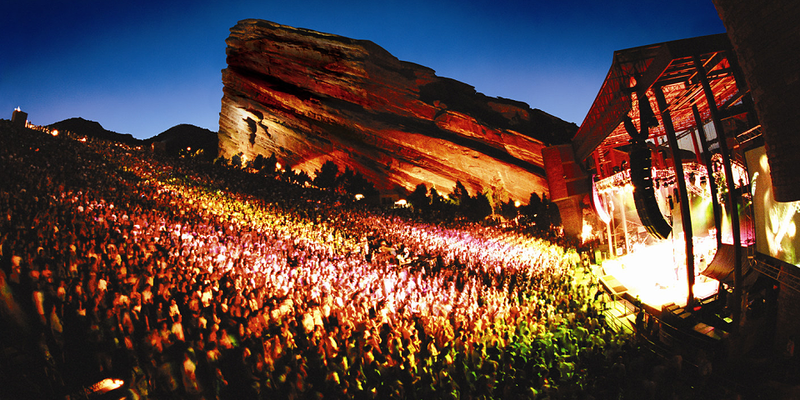 Fiddler’s Green Amphitheatre – Fiddler’s Green Amphitheatre hosts top touring bands in a unique, outdoor concert setting. This summer’s concert series will feature Paul Simon’s farewell tour, top country band Sugarland, Weezer, Dave Matthews Band, Poison and more. Mile High Stadium – Mile High Stadium, home of the NFL’s Denver Broncos and MLL’s Denver Outlaws, will host several concerts this summer. On May 25, Taylor Swift’s Reputation Stadium Tour will take the field with opening acts Camila Bello and Charli XCX. On June 30, Kenny Chesney will bring his Trip Around the Sun tour to Mile High Stadium, along with fellow country music superstars, Thomas Rhett, Old Dominion and Brandon Lay. On August 4, Luke Bryan’s What Makes You Country tour stops in Denver with Sam Hunt, Jon Pardi and Morgan Wallen. Coors Field – Home of MLB’s Colorado Rockies, Coors Field has hosted a few summer concerts in between regular season games. This year, the downtown Denver stadium will host the Eagles’ 2018 North American Tour featuring Jimmy Buffett & The Coral Reefer Band on June 28. Popular 80s rock bands, Def Leppard and Journey, will take the field on July 21. Pepsi Center – Pepsi Center, which usually hosts games for the NHL’s Colorado Avalanche, the NBA’s Denver Nuggets and the NLL’s Colorado Mammoth, will host several international superstars. P!NK’s Beautiful Trauma World Tour with DJ KidCutUp will play on May 8. Vans Warped Tour, the final full cross country tour, will take over Pepsi Center grounds on July 1, bringing artists like 3OH!3, Pennywise, Reel Big Fish and more to multiple stages. The Juke Box Heroes Tour featuring headliners, Foreigner, alongside Whitesnake and Jason Bonham’s Led Zeppelin Evening, comes to Pepsi Center on July 24. Panic! At the Disco’s Pray for the Wicked Tour with Arizona and Hayley Kiyoko plays on August 7. Chris Stapleton will bring his All American Road Show to Pepsi Center on August 10. Rob Zombie and Marilyn Manson: Twins of Evil will play The Second Coming Tour on August 20. Sam Smith will bring The Thrill of It All Tour to Denver on August 21. Rod Stewart and special guest, Cyndi Lauper, will play on August 22. To close out the summer concert season, Bruno Mars will return for his rescheduled 24K Magic World Tour stop with Cardi B on September 7.